Shelley Acker has started a new business that crosses boundaries between studio and retail space. In her window is a tiny life-like diorama of a bakery. Her sign reads Freedom Miniatures. The space is a combination of retail shelves on the right, and shelves showcasing tiny but shockingly realistic creations on the left. Behind the counter is a studio, where Shelley creates her miniature worlds. Shelley describes herself as an “artist in residence,” and puts a tremendous amount of imagination and personal experience into her work. As an example, the image you see on the cover has a number of miniature paintings that are shrunken versions of artwork done by Shelley’s mother. Awe-struck and a little befuddled, The Grapevine asked Shelley a few questions about her new venture. The Grapevine (GV): Tell us about the world of miniatures. Do miniaturists call it a hobby? A craft? An art? How would you describe it? Shelley Acker (SA): It depends on what it is about miniatures that appeals to you. If you are a collector and not a builder, then I would say it is more of a hobby. If you dabble a bit in making things and don’t want to invest too much in what you are doing, then you might call it a craft. Many people are a combination of these two. For me, I am a maker and I am following my passion. I call what I do works of art because it is more than simply making something small. I also strive to make it realistic. My goal is to get to the point where someone looks at a picture of one of my creations and they think it is real life. My art style is realism and my medium is miniatures. The miniature world recognizes the artisanship of its members and there are incredibly talented people all over the world. The International Guild of Miniature Artisans bestows artisan status on those who apply and meet the juried standards necessary. It is something I may seek out in the future. GV: How did you get into miniatures? SA: Essentially, it was the result of a realization that most every time I made something, I made it small. My mom reminded me about when I was in Girl Guides and we were challenged to see how many items we could get into a matchbox. I think I managed to get 50 items into mine. So, there has always been an affinity for tiny things. My official miniature journey began with a dollhouse. Then I started making “roomboxes.” These are generally a square foot or smaller, and represent a particular scene. From there I just kept getting smaller and smaller until I found I was making furniture. Today I do a real mix of things, from roomboxes or dioramas, to smaller vignettes, and soon will be getting back into making furniture. GV: What motivated you to start your own miniature studio in Kentville? SA: Many times people say “some day I will…” I guess my “some day” showed up. My dream was to make a living making miniatures. Recently, my life took a turn that required me to drastically rethink what I was doing. One day as I drove down Webster Street, I had to stop in traffic for a red light. I just happened to look to my right and saw the “for rent” sign in the window, and suddenly I knew what I could do. After that it took shape rather quickly. I have not followed a traditional path with business plans and months of research, but I am figuring things out as I go, living incredibly frugally, and doing everything I can to make this business work. GV: There is a whole miniature community out there. Can you tell us a bit about Camp Mini Ha Ha and other miniaturist events or forums? SA: It has been amazing how many miniaturists from the area I have heard from since opening the studio. Camp Mini Ha Ha (CMHH) is an incredible event held every September at the Annapolis Basin Conference Centre here in Cornwallis. It’s a five-day miniature retreat where everyone starts with a basic project kit and makes it whatever they want it to be. There is a concept provided, and campers either follow along the lines of the prototype or go in another direction altogether. There is a freedom to create at CMHH that is not matched by other miniature events anywhere. There are campers from all over Canada and the US, and there was even a camper from Wales! 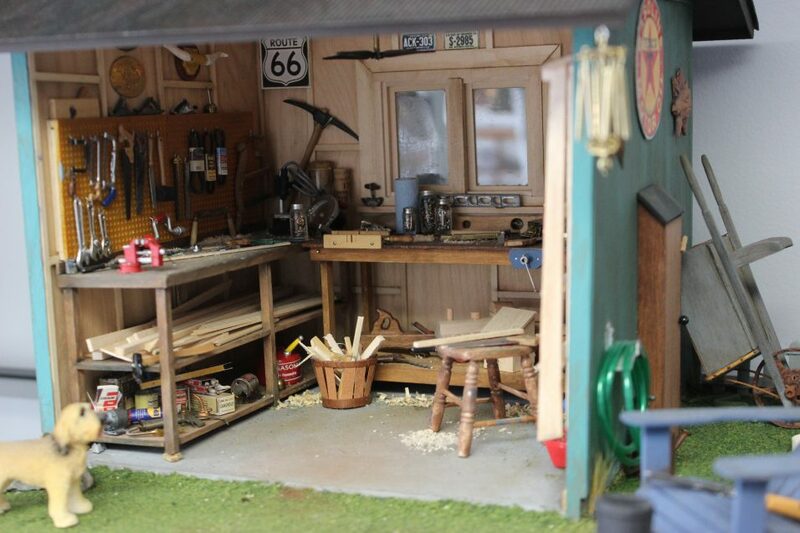 Other than Camp Mini Ha Ha, there is an annual weekend gathering in Ontario which offers workshops, and there are several miniature shows across the country where club members showcase their creations and vendors sell their wares. The closest miniature show that I know of takes place in Fredericton in October. GV: What services and products do you offer at your studio? SA: Currently I offer my own creations, which include larger pieces that present a vignette or combination of a couple of rooms, handmade furniture and some accessories, as well as themed pieces such as croquet sets and fairy ornaments. I also have the works of other Nova Scotian artisans: original paintings and pencil sketches, clay foods and food-filled plates, tiny fairies and bullrushes, and turned small wooden bird house ornaments. There is also a selection of items for those who are interested in fairy gardens and fairy doors, as well as artist supplies: paints, varnishes, weathering powders, and so on. Still to come are an assortment of LED lighting supplies, miniature “lumber” in a variety of woods, and working light fixtures. I will also be offering workshops led by myself or other artisans. As well, I will be starting a bi-weekly “drop-in” night: an opportunity to bring a project and work on it with other like-minded mini people. Located at 45 Webster Street in Kentville, Freedom Miniatures is open Wednesday through Friday 10am – 5pm. For more information visit the Freedom Miniatures Facebook page.